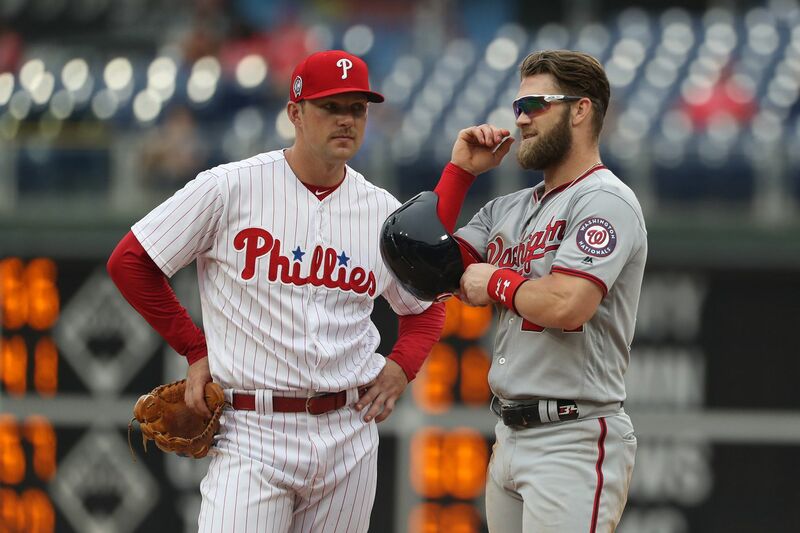 Rhys Hoskins (left) and Bryce Harper chat during a replay during a game on Sept. 11 vs. the Nationals on Sept. 11. When the Phillies begin their offseason pursuit of a certain Washington Nationals outfielder, they'll find themselves negotiating with an agent who is starting to become very popular in the team's clubhouse. Rhys Hoskins became the most recent Phillie to sign with Scott Boras, baseball's power agent, earlier this week. Boras represents free-agent-to-be Bryce Harper, along with Jake Arrieta, Vince Velasquez, and Nick Williams on the Phillies. Hoskins was represented by Brodie Scoffield, who recently left the Legacy Group. "It came down to a decision where I felt like Boras' team, the people he has working for him, and himself are going to give me the best chance to be the best baseball player I can be," Hoskins said. "He has resources on resources on resources, all of which I'm really looking forward to taking advantage of. It really just comes down to me wanting to be the best baseball player I can be." Hoskins cannot become a free agent until after the 2023 season and needs to play two more seasons before he is eligible for salary arbitration. But there is a chance the Phillies could sign Hoskins to a long-term contract that would buy his three arbitration years and perhaps a year of free agency. Would Hoskins be open to that? "It's not up to me," Hoskins said. "To be as blunt about it as I can, if I have the opportunity to stay in this city and be a part of this organization for my lifetime, I'd want that. I love this city. I love this organization. I love the staff that's here. I love the teammates that I have. Obviously, things about that change. But I've really taken to this city. This city is a special place to me. If I ever have the opportunity to be here for my career or long term, I would 100 percent want that." If the Phillies land Harper, it could lead to a return to first base for Hoskins. It has been interesting to see manager Gabe Kapler deploy Carlos Santana sporadically at third base this month and play Hoskins at first base to give the team an optimal defensive outfield. Perhaps that could be the way the corner infield looks next season, if the Phillies can lure Harper to join their outfield. If they need any help, Hoskins seems to be a good advocate. He and Harper struck up a friendship during this year's Home Run Derby and were seen "bro-hugging" last week, while the Phillies blow-torched their field. "The guy's a cool dude," Hoskins said. The Phillies begin an eight-game road trip Thursday with four games in Atlanta, followed by four in Colorado. Vince Velasquez will start the series opener against Braves righthander Kevin Gausman. …The Phillies will move up their Sunday home games next season from 1:35 p.m. to 1:05 p.m. after surveying season ticket holders. The Phillies are one of just four teams to play Sunday games at 1:35 p.m.